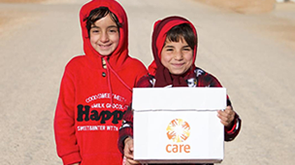 CARE began working in Tanzania in 1994, in response to the influx of refugees fleeing the Rwandan genocide. Since then our work has widened to include women's empowerment, smallholder agriculture, natural resource management, and climate change adaptation. Our current focus is on empowering rural women and girls. We help girls access quality basic education and our village savings and loan schemes empower women and boost livelihoods. In rural areas, most people rely on natural resources for their living. We help communities use the land effectively while also conserving the environment. In the Shinyanga region of Tanzania, early marriage is considered the norm and girls are married in order to provide much needed income for their family’s survival. In addition, early pregnancies are common, resulting from sexual abuse or consensual relationships. These factors, and others such as ill health, contribute to high school drop-out rates. The Jifunze! project focused on adolescent girls between the ages of 10 and 17, targeting primary school dropouts, orphans and other vulnerable children, and adolescent mothers. Based on CARE’s previous experience with girls’ education programming, a smaller number of boys were also included – this helped to avoid bias and provide the boys with an opportunity to work alongside girls, and become proponents of girls’ rights. The project provided access to equitable, quality education for 2,000 students (1,600 girls and 400 boys) in primary school, and 80 girls in secondary school. CARE Tanzania's Wezesha programme aims to empower rural communities to empower rural women. To achieve this, CARE Tanzania is placing partnership at the heart of its strategy. The Wezesha programme is not about what CARE will do on its own. It is about what CARE and other actors will do together. Under this new approach, CARE Tanzania will gradually change from directly implementing programmes at grassroots level to the more indirect and supportive roles of facilitator, networker, alliance member, coalition-builder, capacity-builder, action researcher, evidence generator, policy analyst, and advocate. In this new approach, CARE Tanzania aims to work with local organisations to collectively bring about the emergence of vibrant, equitable and resilient rural communities where women are empowered to realise their social, political and economic rights, and natural resources are sustainably managed in the context of climate change.